Mayer, Merkel & Ottmann, Lith. Co.
Hello, my name is Denise. 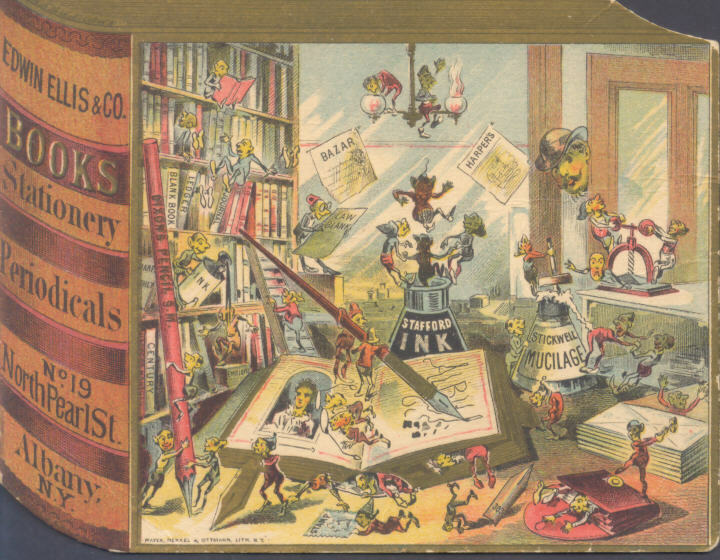 I am a Victorian Trade Card Collector and Curator. The images of the past are my inspiration ~ you can say that they feed my appetite for Creativity! IT'S BECAUSE OF THE TCCA, I HAVE A COLLECTION... My collection is as diverse as the constellations found in the sky. I generally collect trade cards for a variety of reasons and from many categories. You will learn of those reasons in what follows. You may also notice the realm of categories... You'll probably find that there are more for you to learn about! An Eyeful of Delight! The formality in the arrangement of furniture in the dining room, Sets the Backdrop for the Casual Portiere (entryway). But I Think It Is the Suit of Armor, Standing Guard Beneath the Announcement that Jas. 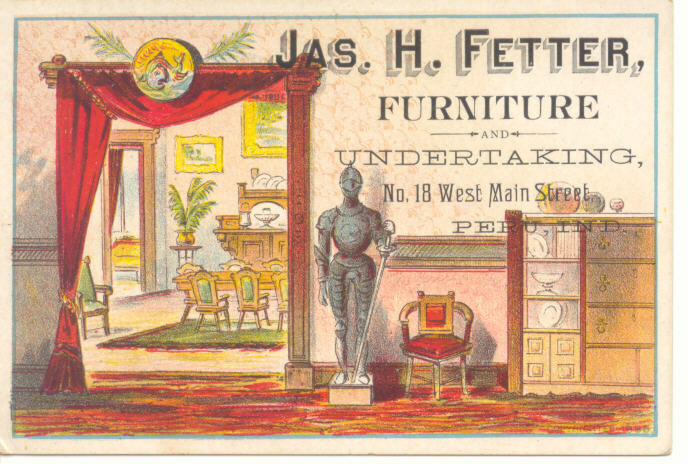 H. Fetter Not Only Sells Furniture... He Is Also An Undertaker! Head to the Contents Zone on the TOP of this page. Click & Enjoy the pages created thus far. Is there something you'd like to learn more about? the "craze" of the 19th Century! of a little more than a century ago! knew what to buy and from where!! 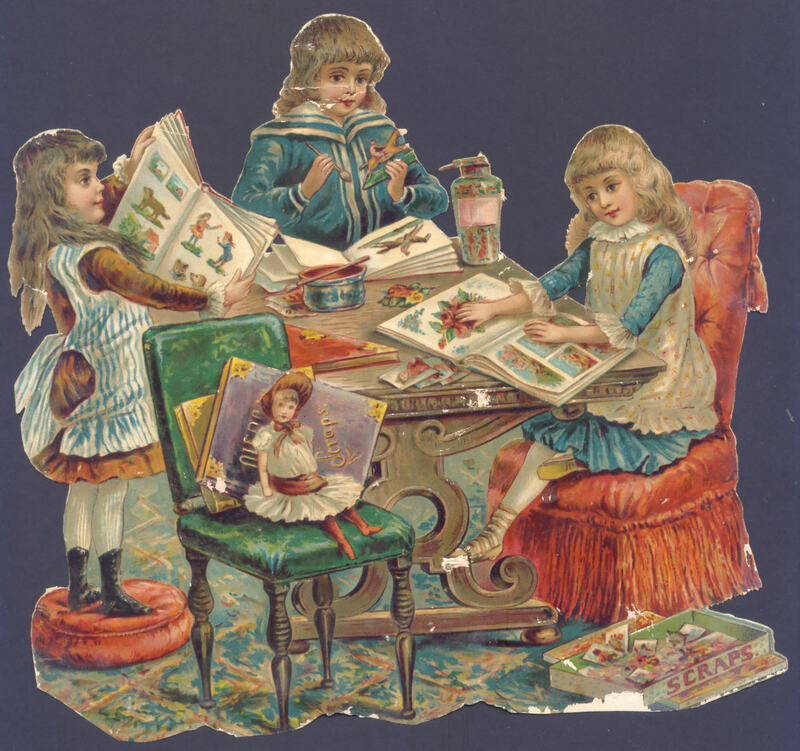 Children had the habit to paste those trade cards into their books... FIRST! on the page of the Scrapbook. Let's travel a journey to look at those wonderful items. Let's learn why they were saved as 'Family Heirlooms'. You will discover that these Pieces of the Past, show life, not unlike it is today. What's Ahead In the Up-Coming Weeks? Reverse Psychology, from the 1996 TCCA Convention. Carter's Little Slice of American Pie, 2000 TCCA Convention. C. M. Henderson & Company, An Examination In Progress, 1998 TCCA Convention..
Schools of Thought, 1996 TCCA Convention. Hear Ye, Hear Ye, One and All ~ Good Humor Has Arrived! Click To See Good Humor! Click To Send Your Message. and creative property of Denise L. Croke, Mahalo!.